LUSH – Bangkok’s Green Night Out – is back on Friday 19th of August on the city’s largest outdoor rooftop and in indoor sky bars. For the first time in Bangkok, 15 international DJs and musicians will play on 4 dance floors and a completely redecorated helipad on the 40th floor of the Imperial Queen’s Park Hotel. 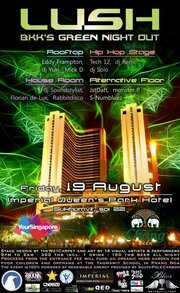 ★ 4 indoor and outdoor rooftop dance floors on Bangkok’s largest rooftop and helicopter landing pad. ★ 15 major international DJs and musicians from the most well-known clubs in Thailand playing hip hop, house, funk and disco, and a special alternative themed space. ★ 14 additional live visual artists, performers and dancers. ★ Oversized decoration and stages. ★ 100 THB beer all night. ★ 300 THB entrance, including 1 drink. ★ Profits made from the entrance fee will fund the creation of an organic herb learning and income generating center for poor children and orphans at the Yaowawit School Kapong in Phan Nga. ★ The event is 100% carbon neutral through clean renewable energy produced in Thailand and provided by South Pole Carbon Asset Management Ltd.
From 9pm to 2am, at Imperial Queen’s Park Hotel, Sukhumvit Soi 22, 37th and top floors. No worries about rain: we are prepared for any eventuality. This LUSH event is powered by Chang Beer, YourSingapore.com, Imperial Queen’s Park Hotel, South Pole Carbon Ltd., Cat & Nat, and Bless Entertainment, and with the participation of Bangkok Nightclub Network, Theme Club, Golden Touch, Cheeze Magazine, CMYK, La French Riot, Gutter Rainbows, Trust The Sound, Fresh Francis, Anthony Allen Photography, Double Electrix Divas, and Lifestyle Asia.